Humphrey Bogart’s journey as a leading man started with The Maltese Falcon and reached its pinnacle in The Treasure Of The Sierra Madre. That’s not just because his performance was so terrific. What’s impressive is that Bogie goes from an ultra-cool detective in Falcon and a noble Nazi-killer in Casablanca to a crazy loser in Sierra Madre. He didn’t coast by playing lovable heroes. He was willing to look terrible and to play a despicable human being in a character-actor kind of way. Fred C. Dobbs (Bogart) is a jobless American in Tampico, Mexico, begging for food money. He pools what money he has with that of a friend (Tim Holt as Bob Curtin) and they head out with Howard (Walter Huston) for the titular mountain to find gold. Howard has been on many such journeys and knows this isn’t going to turn out well. It doesn’t take more than few months for Dobbs’ paranoia to cloud his vision. Before long, he’s hiding his gold and proving he’ll do anything to protect his burgeoning fortune. Don’t worry, “Badges? I don’t have to show you any steenking badges”, I haven’t forgotten about you! Yup, this is the movie with that quote. People love (mis)quoting the line, but they shouldn’t overlook the subtext: there’s no law up in the wild Mexican mountains. Then again, the real villain is not a gang of baddies. It’s Bogie. Dobbs’ alienation of his friends not only proves how paranoid he is, but in doing so, he puts his gold and his life in serious danger from steenking bandits. 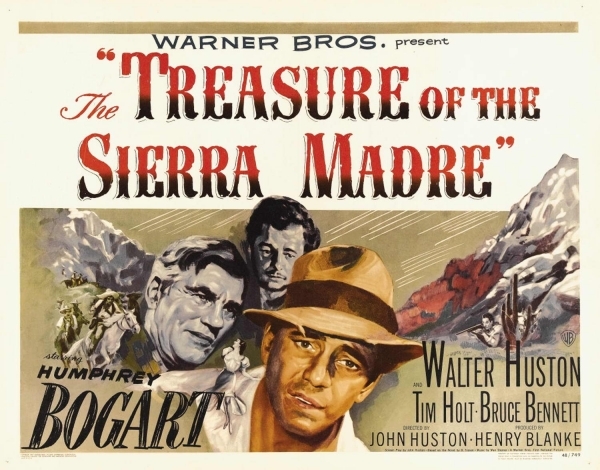 The Treasure Of The Sierra Madre was highly ranked on both the 1998 and 2007 Top 100 lists released by the American Film Institute…and rightly so. It’s nearly 66 years old and it holds up remarkably well. Writer/director John Huston made several fine films, but this was his peak. It’s one of the best pictures of the 1940s and its dirty influence continues to this day, with Paul Thomas Anderson and Breaking Bad’s exec producer Vince Gilligan citing it as highly influential of their recent projects. This one is rough, but for all the right reasons. Great, great movie.